What’s more impressive in a prairie than a bull bison? Standing over 6 feet tall at the shoulder, and weighing up to 2000 lbs or more, they can inspire awe, fear, and hope all at once. While truly massive, bison are also surprisingly nimble and fast – they can run at speeds up to 40 miles per hour. Bison bulls at The Nature Conservancy's Niobrara Valley Preserve in the sandhills of Nebraska. These three bulls were grazing in a recently-burned portion of sandhills prairie when I came upon them while hiking last May. I kept my distance and tried to get a few photographs of them as they slowly sauntered away – not exactly running away, but not hanging around either. The bulls had been feeding in a recently burned portion of the prairie, and while they moved out of it to get away from me, I’m sure they returned to that lush new growth after I left them alone. What is it about bison that stirs up people’s imagination? 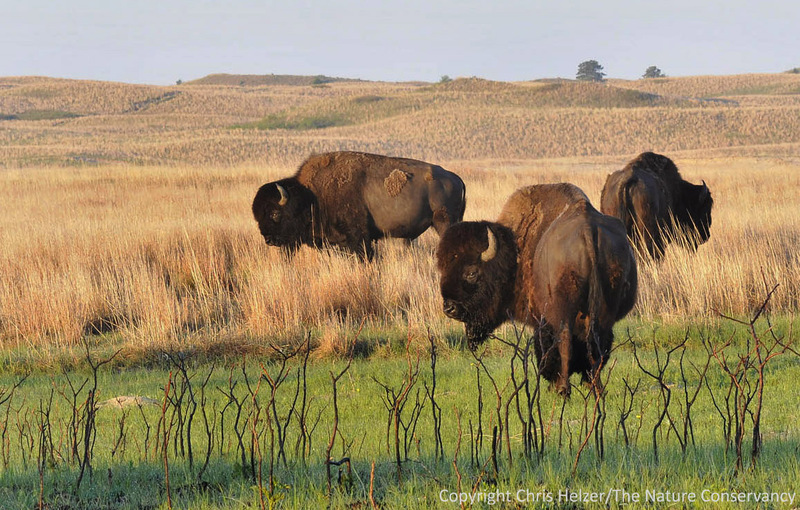 Whatever it is, it was in full force in October 2008 when the brand new bison herd rolled off the truck at The Nature Conservancy’s Broken Kettle Grasslands in northwestern Iowa. I was fortunate to be on hand for the event, and it was a treat to see the bison, but also to see the excitement of the people gathered around to welcome them. As the bison milled around the corral, getting used to their new home, everyone watching was doing the same thing – imagining what they would look like when they were eventually released into the hills just to the east. In addition, I’m absolutely sure that everyone there was thinking about what it must have been like hundreds of years earlier when seeing bison in the same hills would have been exciting, but not particularly surprising. We’re very fortunate that we can not only conjure up images from the past, but that we can also envision a future for the American bison – a species that could easily have gone the way of the passenger pigeon. 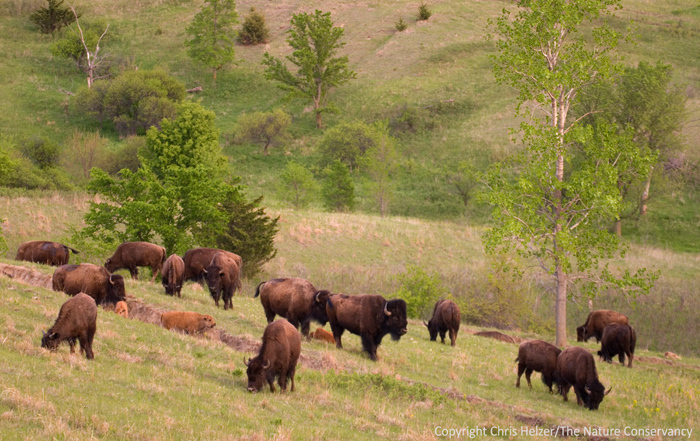 A small group of bison, including the first crop of calves, at the Broken Kettle Grasslands in the northern Iowa Loess Hills - May 2009. The above photo was taken in May of 2009 – the spring after the bison were brought to Broken Kettle, and not long after the first calves were born. I spent an evening and morning following the bison around their new home, making sure to keep my distance to avoid making them nervous. (No one wants a nervous bison.) I hope to make it back up to visit them soon. The herd at the Broken Kettle Grasslands has now grown from 28 to 51. The long-term goal is to grow the herd to about 250 animals. If you’re interested, you can click here to read more about the bison at the Conservancy’s Broken Kettle Grasslands and the plans for their future.